For How Long Does a Red-Tailed Hawk's Molting Last? Birds periodically discard and replace their feathers in a process called molting. During the process, birds will look mottled or ragged, making positive identification difficult. Red-tailed hawks (Buteo jamaicensis) provide an additional challenge as several color varieties are known for the species. Though these color variations have nothing to do with molting (the color phases are genetic or regional variants), they make identifying molting hawks extremely difficult. Fortunately, molting lasts only a few months in red-tailed hawks. Red-tailed hawks are the most commonly seen hawk in North America. 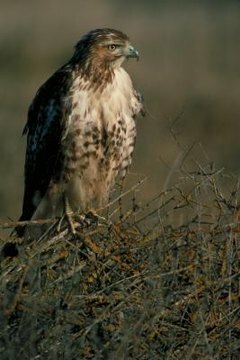 Adapted to a variety of habitats, red-tailed hawks can be found from arid grasslands and scrublands to forested mountains and agricultural fields. They have no predators as adults, and they hunt primarily for small mammals, though they will consume reptiles, insects and birds as well. Red-tailed hawks deposit one to five eggs each year, and typically mate monogamously until one bird dies. Feathers are keratin-based structures that are similar to the scales of snakes or the hairs of humans. Feathers have no capacity to heal themselves as they become damaged by wear and tear. This necessitates the periodic replacement of feathers, and occurs several times in a bird’s life. The process of molting is energetically expensive; accordingly most species molt during times of abundant resources and limited physical demands. After the nesting season has concluded, and the physical demands on birds drop, many birds take the opportunity to molt. Red-tailed hawks molt for the first time during their first year. At this time, the animals, which already resemble adults in many respects, become cloaked in their full adult plumage, including the namesake red tail. Despite the fact that these young birds now look like mature adults, they will not become sexually mature for another year or two. The molt begins in early summer to late fall, and usually is complete by the end of the fall. Captive birds are known to molt at the end of their first year, but as with their wild counterparts, the timing and duration of the molt varies greatly between individuals. Adult red-tailed hawks molt annually. The molting process is complete, as opposed to some species which have two or more partial molts. The molt generally begins in the spring, and is completed by September or October. Accordingly, identification attempts during the summer require very careful observations. To distinguish red-tailed hawks from red-shouldered hawks (Buteo linneatus), look for the tell-tale dark brown or red chest markings of the red-shouldered hawk, which still likely are visible while molting. To ensure you are not looking at a Swainson’s hawk (Buteo swainsoni), look for the black bar on the trailing edge of the wing and dark chest that is not present in the red-tailed hawk. Are There Hummingbirds in the Northeast US?